Printer Ink Yield: What Does It Mean? When someone is planning to buy a new printer, you know what we tell them? We tell them to not just look at the discounted prices of the printers available in the market. We tell them that there’s something even more critical when buying printers than the initial cost. We tell them to look at the printer ink yield or the toner yield of the cartridges that will be used in the printers that they’ll be buying. The reason why printer ink yield and toner yield is important is that they define the cost per page variable pertaining to that particular printer. Costs per page add up to the operating costs of the printer. In the case of most modern printers, the operating costs are much higher than the cost of purchasing in the printer in the first place. Cost per page can be calculated with the help of the printer ink yield which is usually provided on top of cartridges in the form of ‘x’ number of pages. However, have you ever wondered how all the toner and ink cartridge manufacturers even calculate the total printer ink yield and printer toner yield? After all, all your printing requirements can’t be the same. 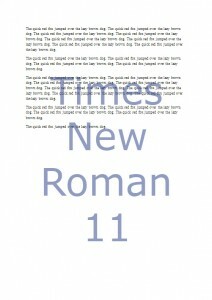 Take text printing for example. Sometimes, your printed page will contain 400 words while other times it will contain 200 words. If all your prints are not same, then how do cartridge manufacturers claim that a cartridge can print ‘x’ number of pages? We’ll answer this and some more questions for you. What Does Printer Ink Yield Or Toner Yield Mean? 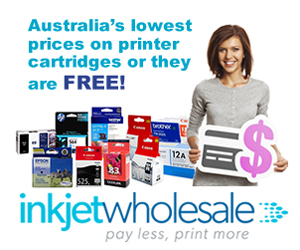 Let’s suppose that you’ve purchased a black and white ink cartridge. On the box of the cartridge, the print says that the cartridge can print 600 pages. Now, consider a colour cartridge whose box says that it can print 300 pages. Sometimes, you’ll even come across cartridges that big brand companies claim will print twice the amount of pages that a normal cartridge of the same model will print. You’ll find that different types of cartridges have different printer ink yield or toner yield. Obviously, this is directly related to the amount of ink or toner in the cartridge. But, more importantly, these estimates are based on a standard. This standard is five percent page coverage. What Is The Five Percent Coverage And Where Did It Come From? Five percent page coverage means the percentage of a standard page that the ink will cover. When a cartridge’s printer ink yield or toner yield is specified to be ‘x’ number of pages, then it means that that cartridge will be able to print ‘x’ number of pages with five percent coverage. Since every manufacturer uses the same metric of five percent page coverage when mentioning printer ink yield or toner yield, it’s quite obvious that a third party organisation established a standard for all of them to use. This third party organisation was the International Organisation of Standardisation or ISO. ISO set this standard by devising a set of pages for figuring out the printer ink yield and toner yield for various cartridges. These documents are a part of the ISO/IEC 24712 series. The standardisation of the printer ink yields and toner yields is a complicated process that involves multiple variables and elements. So, while we’ve explained the basics of the five percent coverage concept, we haven’t really gone into the details of how the standards have evolved over the years. However, the changes haven’t been big either, so the evolution of these standards can be safely neglected. The description of the five percent page coverage concept should refine how you see the printer ink yield and toner yield numbers on the cartridges you buy. To you, these numbers should now mean that the cartridge you’re about to buy will be able to print ‘x’ number of pages in the same format as specified by the International Organisation of Standardisation. The printer ink yield or toner yield numbers don’t define how much you’ll be able to print because sometimes your pages will require more ink than five percent and sometimes less. At the same time, the printer ink yield and toner yield estimates are useful because they allow you to compare multiple cartridges easily and quickly. Should You Bother To Measure The Page Coverage Of Your Prints? There’s no real point in trying to figure out the page coverage of your prints, unless you’re in the printing business. If you’re a Printing Service Provider (PSP), then it may be crucial for you to know how much page coverage your different print tasks are achieving so that you can try and find ways of reducing your costs. In such a scenario, you may need to get a proper software program for evaluating how much page coverage your printing tasks are getting. There’re a few available in the market, but one of the more popular ones is this one here. If you’re not a PSP and are simply curious as to how a five percent covered page looks, then we can help. Typically, a five percent covered page is half covered. As you can see from the images we’ve provided, the fonts you choose don’t make a difference in how the page looks because all of them look to be covered about halfway through. Does Your Choice Of Fonts Affect How Much Ink Or Toner You Use? 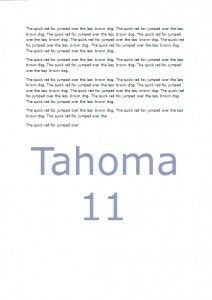 You can see in the images that a five percent covered page looks the same, regardless of which font is being used. However, the font you choose to print in can have a huge difference in how much ink or toner you actually end up using. You might be thinking that the difference between multiple fonts isn’t all that much and you’re right about that. What you haven’t considered is that if you combine these differences over, say 500 pages, the difference becomes huge. A lot of research has been done on the relationship between a font and the amount of ink or toner it uses. 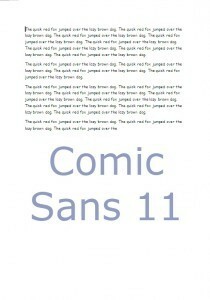 The font Comic Sans is considered to be one of the worst fonts that you can choose for your printing tasks. Compared to other fonts, one of the best fonts you can choose to use to save ink and toner is Garamond. Another good font that you can choose to use is Times New Roman which is almost as good as Garamond. 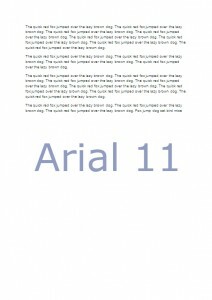 We’ve done a whole assessment of which fonts is best for saving printing ink. You can check it out here. What all this means is that when it comes to assessing printer ink yields and toner yields, quantity matters. 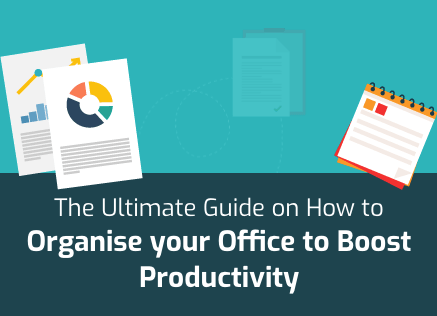 If you don’t use your printer a lot, then printer ink yield, page coverage numbers, and your choice of fonts won’t make that much of a difference to you and your balance sheet. However, if you’re one of those people for whom the printer is a key tool of everyday function, then you can’t really avoid paying attention to your choice of fonts, your page coverage, and especially your printer ink yield or toner yield. If you choose wisely, then you can actually end up saving huge sums of money! How Much Ink Is There In Compatible Printer Cartridges? Which printer uses less ink? Your Printer’s Low Toner Cartridge Yield Explained!